The annual report from the Social Security Board of Trustees shows that the Trust Fund will begin running a deficit in 2018, while the long-range future of the fund causes even more concern. The Board of Trustees of the Social Security Trust Funds issued their 2018 report on the operations and status of the funds, and the news wasn’t encouraging. The Board reported that for the first time since 1982, the total cost of Social Security retirement benefits paid in 2018 will exceed the total income generated by the fund, including tax revenue and income from investments. As a result, it’s expected that the funds available to pay benefits to retired and disabled workers will be fully depleted in 2034. A depleted Trust Fund doesn’t mean that benefits will stop being paid, however. As long as there remains a workforce that is paying taxes into the fund, there will be money available to pay future retirees. Those benefits will have to shrink, however – down to 79% of scheduled benefits in 2034, eventually falling to 74%. The Board offers some suggestions on how to ensure maximum benefits are paid to current and future retirees, but they are clear that the longer it takes to implement changes the harder it will be to ensure benefits remain available for future generations. The Old Age and Survivors Insurance Fund (OASI) pays benefits to retired workers, their families and survivors of deceased workers. The Disability Insurance Fund (DI) pays benefits to disabled workers. These two Trust Funds are separate and distinct legal entities, and one fund is not allowed to borrow from the other. However, the Board typically assumes that if one of the Trust Funds were to be depleted, the laws would be changed to allow the transfer of resources between them. Therefore, the combined balance of these accounts is typically referred to as the OASDI Trust Fund. The combined OASDI Trust Fund began 2017 with total assets of over $2.85 trillion. Net tax collections for the year were over $911 billion while earnings on the Trust Fund were more than $85 billion for the year. The Trust Funds are invested exclusively in special securities issued by the US Treasury, with a combination of short term certificates of indebtedness and longer term bonds. As a result of this activity in 2017 – plus additional expenses and adjustments – the OASDI Trust Funds ended the year with $2.89 trillion. Of this, $2.82 trillion is in the OASI Trust Fund and the remaining $71 billion is in the DI Trust Fund. The Board evaluates the financial condition of the combined Trust Fund over two different time periods – a 10-year short-range period and a 75-year long-range period. Projections are also done using three sets of assumptions– known as the intermediate, low-cost and high-cost assumptions. The different sets use varying assumptions for population variables (birth & death rates, immigration, etc. ), economic variables (workforce participation, interest rates, wage growth, etc.) and program-specific variables (the number of insured workers, tax revenue, administrative expenses, etc.). Lastly, the Board assumes there are no changes in how revenue is raised (such as tax law changes or new investment strategies) or how benefits are to be calculated or paid. Using the intermediate-cost assumptions, the OASI Trust Fund is projected to decline in value in 2018, increase during 2019, and then decline in value every year after 2019 through 2027, the end of the short-range forecast period. By the end of 2027, the Trust Fund is expected to be worth $2.15 trillion. Because the total value of the OASI Fund is expected to exceed 100% of the annual cost of benefits each year, this fund is considered “financially adequate” by the Board for the short-range. Unfortunately, the DI Fund does not meet this test. Using the intermediate assumptions, the DI Fund is expected to decline in value each year from 2019 through 2027, leaving just $35 billion in reserves at the end of 2027. Because the projected value of the fund in 2018 is less than the expected cost of benefits this year and remains that way through 2027 (not taking into consideration taxes and other Trust Fund revenues during the year), the DI Trust Fund fails the Board’s short-range financial adequacy test. In fact, the DI Trust Fund has failed the short-range test every year since the 2007 Board of Trustees’ report. When viewed in aggregate, the combined OASDI Trust Fund is projected to have enough money to pay all scheduled OASI and DI benefits through 2027, thereby meeting the short-range financial adequacy test. 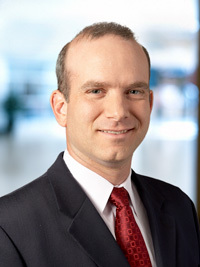 Under current law, one trust fund cannot be used to pay the obligations of the other, though the Board assumes a law change would be enacted to allow this to happen, if necessary. While the short-range forecast shows mixed results, the long-range forecast shows a much different picture for the OASI and DI Funds. The Board projects that the combined OASDI Trust Fund will only be sufficient to fully cover expected costs until 2034, using the intermediate assumptions. After this point, the Trust Fund would be fully depleted. When the Board uses their high-cost assumptions, this depletion is accelerated to 2029, while the fund would remain fully solvent for the 75-year period under the Board’s low-cost assumptions. As the table below shows, this 2034 depletion date is in line with the projections for the last several years. What perhaps came as a surprise is that combined OASDI benefits will exceed tax collections and investment income on the Trust Fund assets in 2018. Just last year, this deficit wasn’t expected to occur until 2022, which was two years later than the 2016 report’s forecast. It’s important to note that once the combined Trust Fund is fully depleted in 2034, the Social Security Administration will continue to provide benefit payments. However, because these payments will only be supported by the tax revenue collected in those years and not investment income or by accessing Trust Fund reserves, those benefit payments will have to be reduced. The Board projects that once the DI Trust Fund alone is depleted, benefit payments will be reduced to just 96% of the scheduled amounts. When the OASI Trust Fund is depleted in 2034, tax revenue would only be sufficient to pay 77% of scheduled benefits. On a combined basis the OASDI Trust Fund could support 79% of scheduled OASI and DI benefits in 2034. By 2092, that would fall to 74%. If changes are made immediately, any one of the following permanent changes would make the OASDI Trust Fund solvent for the next 75 years. The payroll tax used to fund the combined OASDI Trust Funds would need to increase from 12.4%1 to 15.18%, an increase of 2.78%. 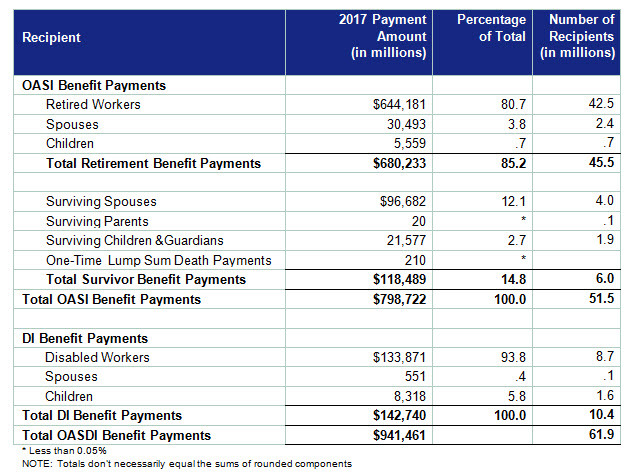 Benefits scheduled to be paid to anyone who becomes eligible for benefits in 2018 or later would have to be reduced by 21%. Current beneficiaries would be unaffected. Increase the payroll tax from 12.4% to 16.27%, an increase of 3.87%. Reduce the amount paid to all beneficiaries by 23%. The following table shows how these possible solutions have changed over the last several years. While the solutions have fluctuated some over time, it’s clear that by waiting to enact some form of change, the required changes become harsher for workers and retirees. The OASDI Trust Funds continue face a significant challenge in meeting their scheduled benefit payments, and those challenges threaten to impact all current and future beneficiaries. The Board of Trustees annually provide estimates of the type of tax increases or benefit cuts that are necessary to ensure the long-range solvency of the Trust Funds, but there is little appetite among politicians –as well as the general public – for these one-solution proposals. As a result, the changes necessary to protect the benefits paid by the Trust Fund become more extreme each year. 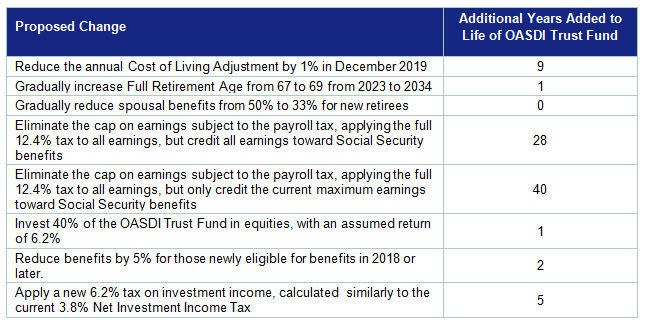 Politicians and others have proposed a variety of other changes to all aspects of the revenue and benefit side of the equation, but many of these proposals would only provide modest extensions to the life expectancy of these funds. As this problem continues to grow, and the date at which the funds are depleted grows closer, it’s incumbent on all sides to work toward solutions. This is not a problem that will be solved by just changing one variable, and all affected parties will need to accept that the most likely solution to this problem will be a combination of increase revenue to the fund, including tax increases, and changes to how benefits are calculated and paid. 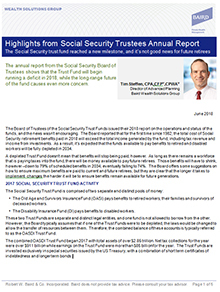 The full 2018 Report from the Board of Trustees, as well as historical Trustee reports back to 1941, are available at the Social Security Administration website by going to www.ssa.gov/oact/tr/. Robert W. Baird & Co. Incorporated. Baird does not provide tax advice. Please consult your tax advisor. 1Both employers and employees share in paying this tax today, which each side paying a 6.2% tax on wages. Self-employed individuals pay both halves of this tax. The required increase could also be split between employers and employees, or could be levied on just one or the other. 2 In 2016, the Board stopped reporting these estimates in tenths of a percentage point.